Viramondo, a musical odyssey that takes the Brazilian singer, Gilberto Gil, to three continents, reveals the power of music to draw different cultures together. 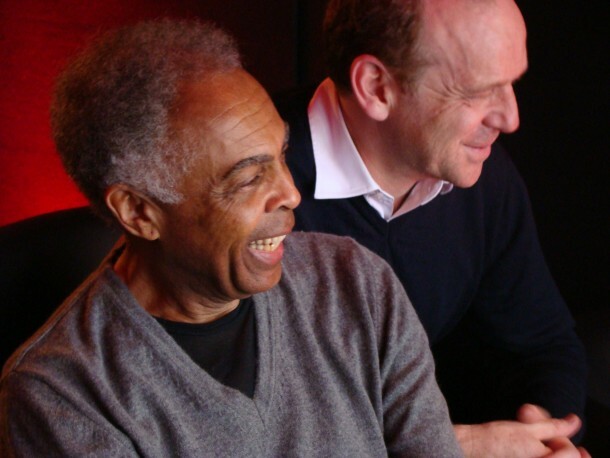 Photo of Gilberto Gil and Emmanuel Gétaz taken by Michèle Laird on 20 April 2013 at the Visions du Réel Festival. The festival, now in its 44th year, is a sharp, touching and troubling look on the world through the lenses of documentary filmmakers the world over. Not to be missed! The film was conceived and created over three years by Emmanuel Gétaz, the co-founder of the Cully Jazz Festival and film director, Pierre-Yves Borgeaud. They had already made a film, Retour à Gorée, with Senegalese super-star, Youssou N’Dour about the forceful exodus of slaves from the African continent. With VIramondo, it’s the other way round. We follow Gilberto Gil as he visits colonized nations, starting in his own Brazil, travelling to Australia and then finally to South Africa. We watch Gil as he strikes up jam sessions with local musicians or engages in conversation with local leaders. We are struck by Gil’s ability to enter into all forms of music and occasionally to just listen: there are some poignant moments in the film made of silences, where the former Minister of culture under Lula demonstrates the skills of an skilled, but empathetic politician. But at the end of the day, music is the common language, notes flying out of voices and instruments in moments of syncopated communion. I was personally struck by the enveloping charisma of Gilberto Gil. He patted me gently on the arm after a short interview, beaming an almost childlike smile. He has reached 70 years retaining the energy and beauty of a young man. The film has been selected for a pioneer EU project entitled the TIDE Experiment “for the circulation of European films in the digital era” and is available on various web platforms, as well a movie houses all over Europe. The album, The South African Meeting of Viramundo, on the other hand, is not the soundtrack of the film, but a mosaic of new songs performed together by Gilberto Gil’s and Vusi Mahlasela, two of which were recorded at the legendary Market Theatre in Johannesburg, in May 2011. Other titles were recorded a year later at Dinemec Studios in Switzerland before a concert at the Montreux Jazz Festival. All arrangements for strings and winds – performed by the MIAGI Youth Orchestra (South Africa) and the Sinfonietta de Lausanne (Switzerland) – were written by South African pianist, arranger and composer Paul Hanmer. They are all very lovely.